Latitude and longitude on Earth. The surface of the Earth can be thought of as a 2 dimensional surface and any point can be specified with 2 coordinates- latitude and longitude. 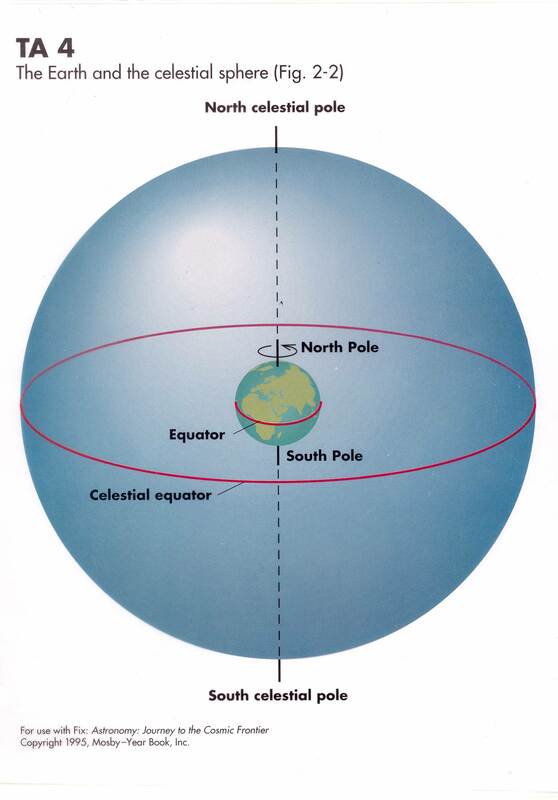 Latitude is the angle between a point and the the equator as seen from the center of the Earth. Longitude is the angle east west from the point to the meridian passing through Grenwich, England. Star paths as seen from northern mid-latitudes. 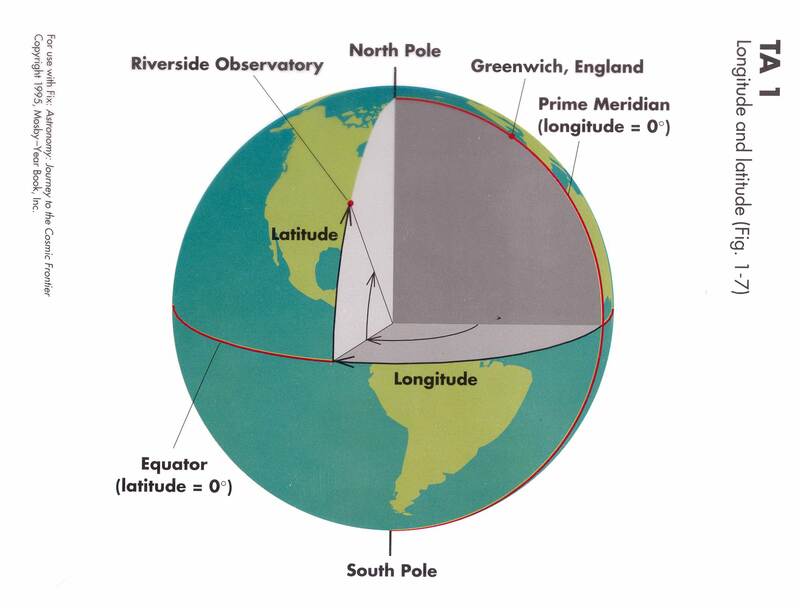 From mid-northern latitudes, the celestial sphere can be divided into 3 regions. First, stars within a certain angle (equal to the observers latitude) of the north celestial pole are always above the horizon. We call these circumpolar stars. A mirror-image region around the southern celestial pole contains stars that are never seen by the observer. Stars between these two circumpolar caps rise and set as the Earth turns. 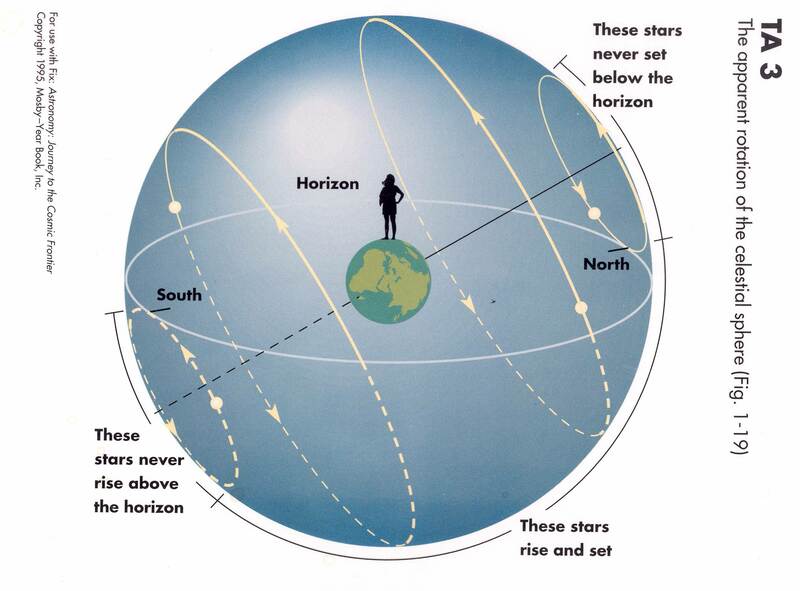 We can only see the half of the celestial sphere above our horizon, of course (unlike the 8000 mile tall woman in the diagram who can see "around" the Earth!). The dashed lines are the (unseen to us) paths of stars below our horizon. Star paths. 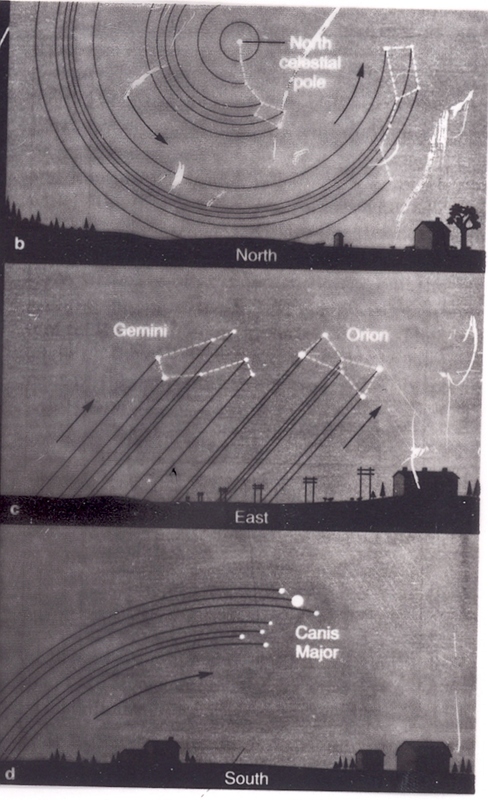 Paths of stars in the sky as seen looking towards the north, east, and south as seen from mid-northern latitude. 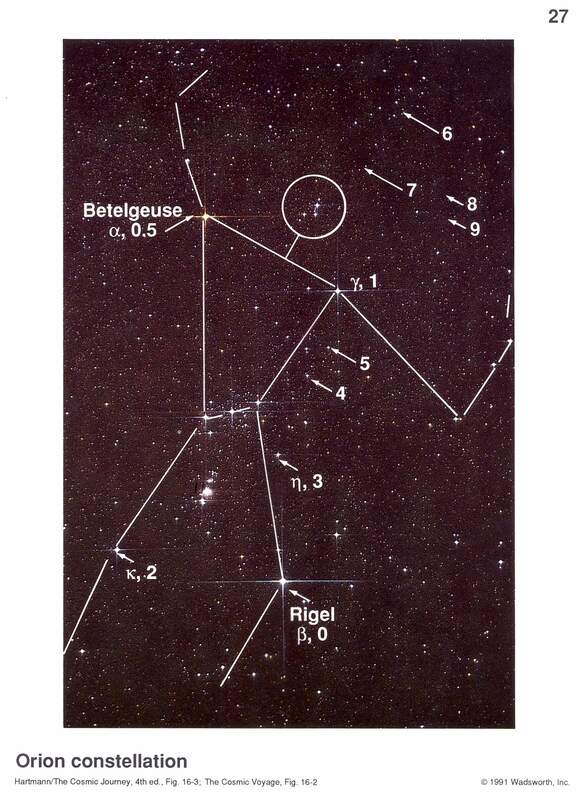 See the preceeding figure to help understand what the star paths look like. 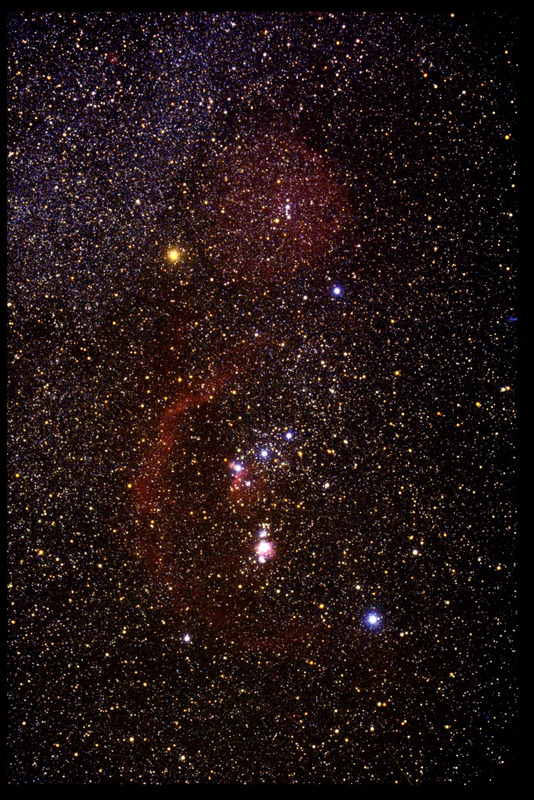 Constellation of Orion (sky photograph) Constellations are mythical people or creatures seen in patterns of stars. One of the most famous and easily visible is Orion the Hunter. This constellation is easily visible in winter skies. 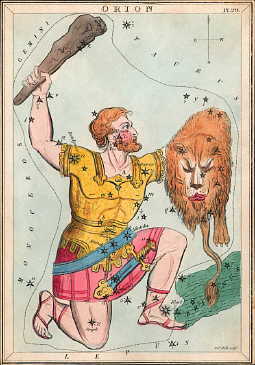 The 3 bright "belt stars" are a very prominent grouping of stars, while bright reddish Betelgeuse (one of "shoulder stars") and whiteish Rigel (one of "knee stars") are also easily seen by your naked eye, even if you are viewing from an area with lots of city lights brightening the sky. 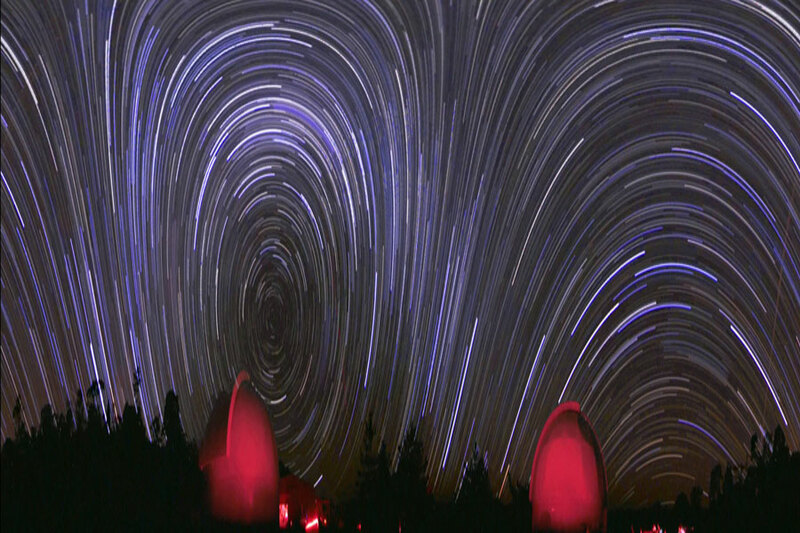 The photograph is a long time exposure (the camera was tracked to follow the motion of the stars, unlike the "star trails" below). It shows many maore stars than can be seen by the naked eye. The red glowing patches are clouds of glowing gas. These are not visible to the naked eye. We will learn more about the gas and dust between stars later in the semester. Orion rising . Here, somewhere in Colorado, the photographer left the shutter open for 20 minutes to catch the trailed stars of Orion rising, closed the shutter for a minute, then made a short exposure to catch the stars as points. Orion always rises "on its side". Here the belt stars form a line perpendicular to the eastern horizon. 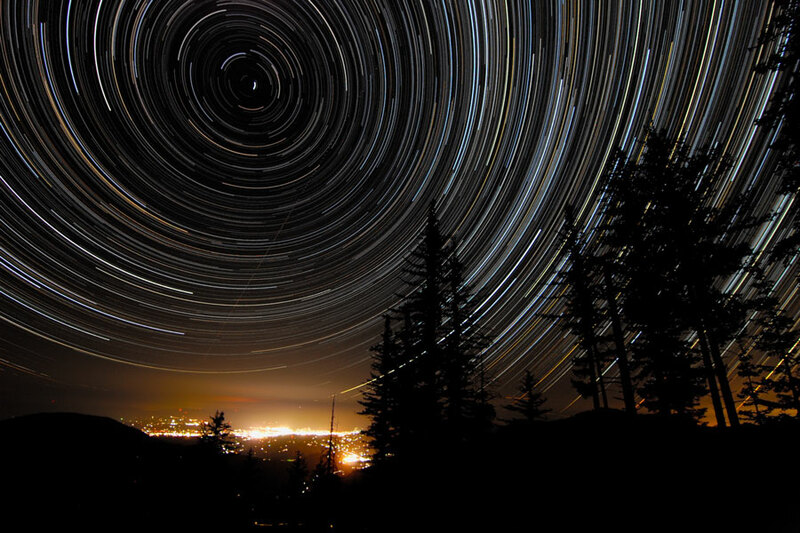 Star trails over Oregon . You can see Polaris (North Star) as the shortest star trail. 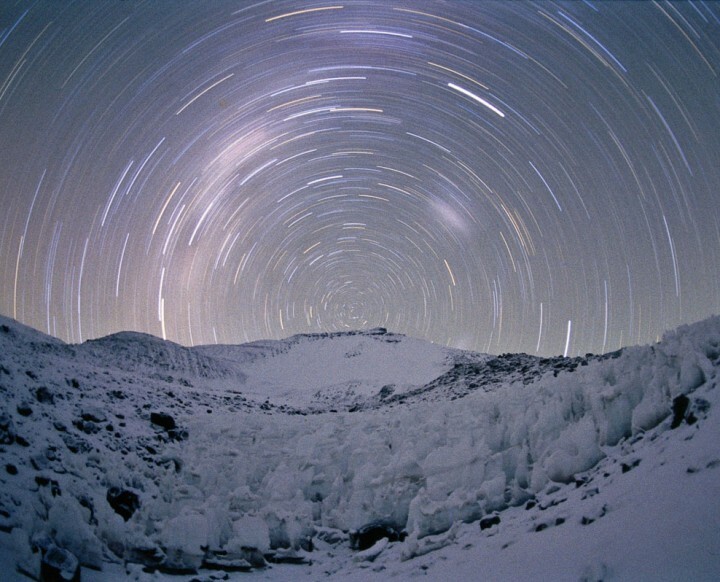 Star trails from Mount Kilimanjaro. 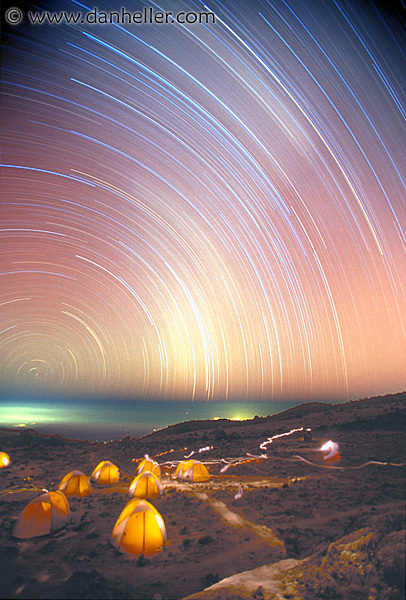 Star trails from a camp high on slopes of Mount Kilimanjaro in Africa. This is taken looking south. Note that the stars circle a point very near the horizon. This is because Kilimanjaro is near the equator (3 degrees south latitude). 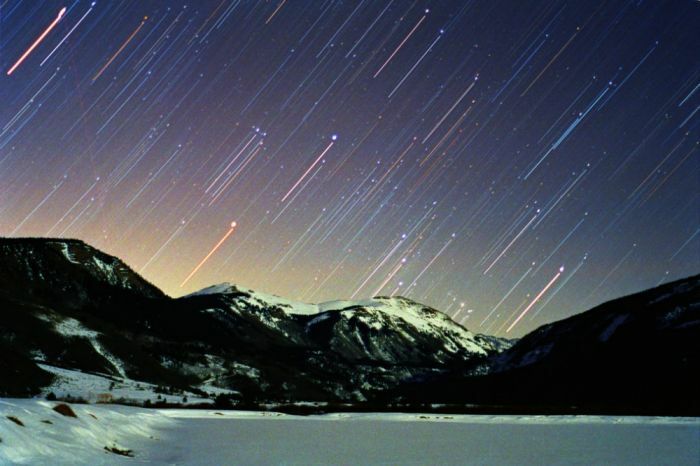 Star trails over Andes peak. Again, looking south from near a big mountain in Chile. To try to understand what is going on, imagine taking this image on a piece of paper, grasping the left and right edges, and forming the image into a cylinder around you head. If you look above the telescope dome to the left of center, you would be looking south. You can see the star trails around the south celestial pole. If you to the right of the right hand dome, you are looking due North. The north celestial pole is not visible, as it is below the horizon from this southern hemisphere location. In between the two dome you are looking east and see the stars around the celestial equator rising above the horizon.